Boy Scout age. We hear overwhelming support for the policy. 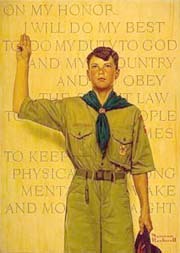 For nearly one hundred years the Boy Scouts of America (BSA) has held an honored place in American society, as it helped shape the character of countless young men with its oath to "do my best to so my duty to God and my country." Of late, however, it has been the target of an exceedingly malicious assault by atheists, homosexuals and social engineers for its commitment to the highest moral standards. This has come from without by funding restrictions and unjust judicial decisions and from within by internal subversion. And make no mistake, the attack on the BSA is an attack on America in microcosm—by the undermining of our religious life and the holding up of traditional values for contempt. As the BSA goes, so goes America! For its part, the Girl Scouts do not prohibit lesbians from becoming members or leaders. Whether heterosexual or homosexual, members and leaders may not promote a particular sexual orientation or display any sexual behavior. To voice your concern, please visit the Girl Scouts of America website. A high level of vigilance and fortitude now must be exhibited by the BSA or, like its feminine counterpart, it will fall by the wayside. Boy Scouts of America Official website.